Tucked away from the lively Leith Walk and surrounded by Pilrig Park, is this cosy and peaceful ground floor property. Close enough to the action that you can enjoy all of the city’s delights however, you can retreat back to this quiet corner to unwind in peace after a jam-packed day. 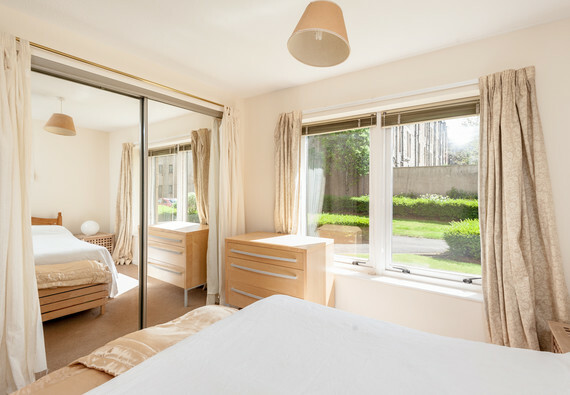 Halfway up Leith Walk, this property is a great location for city escapes. The city centre is around a 20-minute walk away or a short bus ride; alternatively you could travel in the opposite direction towards Ocean Terminal and visit the Royal Yacht Britannia. Take advantage of the variety of multi-cultural taste sensations this area has to offer. If you prefer a bit more of nature in your trip, Pilrig Park is right on your doorstep and the Waters of Leith is a short walk away. From the living room of this property you get a great view of the park through large bay-like windows. Sink in to the cosy sofa after your hard days sight seeing and enjoy the tranquil surroundings as you catch up on your TV. If you can remove yourself for the culinary treats in the area around you, feel free to whip up your own feast in the fully equipped kitchen; complete with oven, microwave and fridge/freezer. After you are suitably fed and watered, settle down for the evening in to the snug double bed and drift off in comfort. In the bathroom you will find a shower over bath, to suit all preferences. For all of your city excursions, make use of Edinburgh’s excellent bus service and explore all of Edinburgh at your leisure. You will find an abundance of frequent services available to you from Leith Walk. Sleeping arrangements One double bed in the bedroom and double sofa bed in lounge. Parking notes One free parking space with this property. No reviews yet for The Balfour Place Residence.